Saracens reached the Champions Cup semi-finals with a clinical seven-try victory against Glasgow Warriors. Glasgow scrum-half Ali Price and Saracens full-back Liam Williams both scored in a frantic first five minutes. Momentum swung Sarries' way after tries from David Strettle and Brad Barritt, before two Adam Hastings penalties reduced the hosts' lead to nine. But second-half scores for Williams, Strettle, Jamie George and Nick Tompkins sealed the win for Saracens. Replacement scrum-half George Horne and number eight Matt Fagerson scored consolation tries for Glasgow, whose hopes of reaching the Champions Cup last four for the first time have ended. Two-time champions Saracens play Munster in the semi-finals in three weeks' time. Mark McCall's side were the only club to win all six of their pool stage matches and continued that form to reach a seventh Champions Cup semi-final. 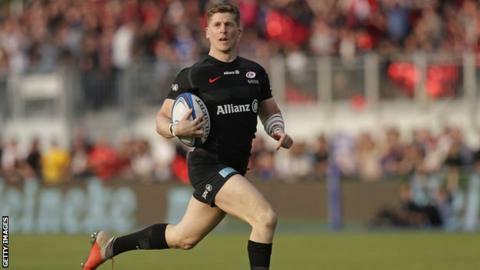 England captain Owen Farrell was a late withdrawal after his wife went into labour, but Alex Goode proved himself a worthy replacement with his role in Saracens' first score. Centre Alex Lozowski had no issues taking on kicking duties in Farrell's absence either, missing just one of his 10 kicks. Saracens' strength was highlighted by the fact that, though Warriors' defence was almost flawless in the first half, it was not enough to keep the current English champions out. After Strettle eventually broke through to score, Barritt found space to go over thanks to deft offloads from the Saracens backs. Glasgow's defence struggled more in the second half as Williams' scythed through for his second try before Strettle intercepted Stafford McDowall's pass to add five more points. George then got on the scoresheet after crossing in a driving maul and replacement Nick Tompkins finished off a slick attacking move to take Saracens over 50 points. But the game ended on a low for the hosts, as captain Barritt left the field on a stretcher with an ankle strain. In contrast to Saracens' pedigree, Warriors were contesting the Champions Cup knockout stages for just the second time and they had only won once in the sides' previous 10 meetings. Injuries to six of Glasgow's players made the task even tougher, though they were boosted by the return of Scotland back Stuart Hogg. The 26-year-old, who has been injured for seven weeks, had an immediate impact as he displayed impressive footwork to create space for Price to score in the left corner. But Hoggs' kicking game let him down and Adam Hastings had to step up in that area - scoring a gutsy penalty from just inside Saracens' half. The full-back was involved in Glasgow's penultimate try, finding a gap to send replacement George Horne over before Fagerson added a third for the visitors. "Alex Goode came in at fly-half and did a magnificent job. David Strettle did a great job off the bench. Liam Williams was great at full-back. "Alex hadn't trained at fly-half all week, although he has played there for the last four weeks. To play with the control he did was outstanding. "To beat a team by that many points in a European quarter-final says you're not a bad team. If you take away the first and last minute, they don't have many points at all." "That was hugely disappointing. We got a hiding from a team that choked us. "They kept down our end and forced a lot of errors from us. "You can't put in a performance like that against Saracens and hope to get a result." Saracens: Williams, Maitland, Lozowski, Barritt, Strettle; Goode, Spencer; Barrington, George, Judge, Skelton, Kruis, Itoje, Wray, B. Vunipola. Replacements: Lamositele for Barrington (50), Koch for Judge (50), Isiekwe for Skelton (50), Burger for Wray (64), Tompkins for Strettle (64), Malins for Williams (69), Whiteley for Spencer (72), Woolstencroft for George (73). Glasgow: Hogg, Steyn, McDowall, Johnson, Hughes; Hastings, Price; Kebble, Brown, Z. Fagerson, Swinson, Cummings, Harley, Gibbins, M. Fagerson. Replacements: Gray for Cummings (15), Halanukonuka for Z. Fagerson (55), Matawalu for Hughes (55), G. Horne for Price (60), Fusaro for Gibbins (68), Bhattie for Kebble (68), Bryce for Brown (68), P. Horne for Swinson (69).